Nvidia has revealed a new AI computer that’s designed to make fully autonomous ‘robotaxis’ a reality. Nvidia’s Drive PX Pegasus computing platform represents a massive leap over its predecessor (the PX 2) and is no less than 10 times as fast, and fully capable of handling a mind-boggling 320 trillion operations per second. That’s enough to allow it to operate a ‘level 5’ driverless vehicle, a fully autonomous car with no need for any pedals or even a steering wheel – these vehicles will be like an office pod (or mobile living room) whisking you to work (and letting you work during your commute). 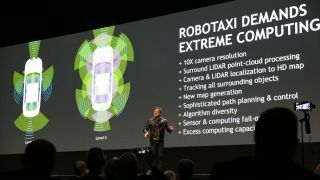 Nvidia notes that Pegasus has to be so powerful because the demands of fully driverless navigation are obviously highly exacting, and include scoping out the environment using 360-degree surround cameras, radars and lidars. And of course massive levels of redundancy have to be built-in to ensure safe operation. Some 225 partners are developing on the Drive PX platform, with Nvidia estimating that in excess of 25 of these companies are working on fully autonomous robotaxis employing Nvidia CUDA GPUs.